VANCOUVER, BC, January 30, 2017 — Mirasol Resources Ltd. (TSX-V: MRZ,) (the “Company” or “Mirasol“) is pleased to announce that it has signed a Letter of Intent (“LOI”) dated January 24, 2017 (the “LOI”) with OceanaGold Corporation to explore the 100% Mirasol owned La Curva Gold Project under a joint venture (JV). OceanaGold Corporation (TSX/ASX: OGC) is a mid-tier, high-margin, multinational gold producer with operations in New Zealand and the Philippines and is also in the process of commissioning the new multimillion ounce Haile gold mine in the United States. La Curva (Figure 1) is a 36,100ha exploration-stage project located at low elevation in an area with favorable infrastructure in Santa Cruz Province, Argentina. 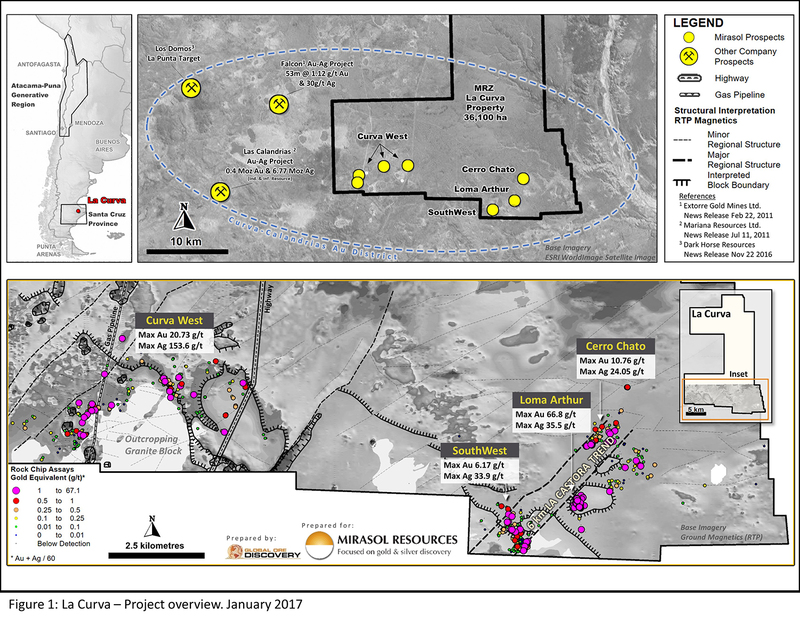 Mirasol has undertaken an extensive exploration and geophysical program at the property over a number of years, which has outlined three priority drill ready prospects (see news releases, January 23, 2014 and April 11, 2008). The prospects include the Cerro Chato, Loma Arthur and South West targets situated along the Company’s 6 km “La Castora” gold trend; a series of additional prospects are also recognized in the Curva West area which warrant further exploration to define additional drill targets. The LOI earn-in terms entitle OGC to acquire a 51% interest in La Curva by completing US$7 million of exploration expenditures over four years and making US$1.5 million in staged cash payments to Mirasol. This includes a first year exploration spending commitment of US$1.25 million with a minimum technical commitment of 3,000 metres of drilling, and a signing payment to Mirasol of US$100,000 (“Minimum Obligations“). Oceana may at its sole discretion cease further spending at any time after it has met the Minimum Obligations by giving prior notice to Mirasol. Following the completion of the initial earn-in, OGC can elect to increase its interest in La Curva to 60% by funding and delivering within two years a preliminary economic assessment (PEA), in accordance with NI 43-101 on an inferred resource of not less than: (i) 500,000 ounces of gold-equivalent at a cut-off grade of 0.25 grams per tonne (g/t) gold-equivalent for an open pit resource; or (ii) 500,000 ounces of gold equivalent at a cut-off grade of 1.5 g/t gold equivalent for an underground resource (the “PEA Milestone“). On completion of the PEA Milestone, OGC can elect to increase its interest in La Curva to 65% by funding and delivering a feasibility study on the Project in accordance with NI 43-101 (“Feasibility Study“) within two years of completing the PEA Milestone (the “Feasibility Milestone“). OGC may additionally elect to increase its interest in La Curva to 70% within the two year time period of the Feasibility Milestone if: (i) the Feasibility Study is of a standard that is suitable to be submitted to a substantial, recognized financial institution as a basis for lending funds for the development and operation of mining activities on the Project; and (ii) a decision to mine is approved by the OGC board (the “Decision to Mine“). Upon OGC earning a 70% interest and making a Decision to Mine at La Curva, Mirasol can elect to retain 30% of the project by providing its pro rata proportion of the development costs, or elect to retain 25% of the project by requiring OGC to provide the financing for Mirasol’s proportion of mine development. If OGC is required to provide funding, then Mirasol’s loan repayments will be made from 50% of Mirasol’s net cash flow from the mine (with super profit additional repayment terms). Interest provisions for the loan will be the lesser of LIBOR+4% or the rate equivalent to which international banks are prepared to fund the La Curva Project on a stand-alone basis. In consideration for OGC providing the development financing, OGC’s project interest shall increase to 75%. OGC has the right to extend one, but not both, of the time periods to complete either the PEA Milestone or the Feasibility Milestone by making cash payments to Mirasol. The terms of the LOI also include provisions for Mirasol to advance and or regain control of the project should OGC fail or elect not to advance the project through each of the post 51% earn-in stages. The LOI is subject to a due diligence review to be undertaken by OGC, and Mirasol has granted OGC an exclusivity period commencing on the signing of the LOI and ending on March 31, 2017 to negotiate and enter into a binding agreement in relation to the JV. Stephen Nano, CEO of Mirasol Resources, stated that he is looking forward to partnering with OceanaGold on the Curva Project, its first JV in South America. He noted that OceanaGold has an excellent track record for the development of high margin precious metal mines and has agreed to commit significant resources to the exploration of the La Curva Gold Project. Mirasol will be the project operator for the first year of the exploration program at La Curva. Permitting for drilling at the project has commenced with the objective of starting the initial drill testing following successful completion of the due diligence process and signing of the binding La Curva JV agreement. Mirasol is a mineral exploration company that is focused on the discovery and development of profitable precious metal and copper deposits via the project generation joint venture business model. Strategic joint ventures with precious metal producers have enabled Mirasol to advance its priority projects, focused in high-potential regions in Chile and Argentina. Mirasol employs an integrated generative and on-ground exploration approach, combining leading-edge technologies and experienced exploration geoscientists to maximize the potential for discovery. Mirasol is in a strong financial position and has a significant portfolio of exploration projects located within Latin America.